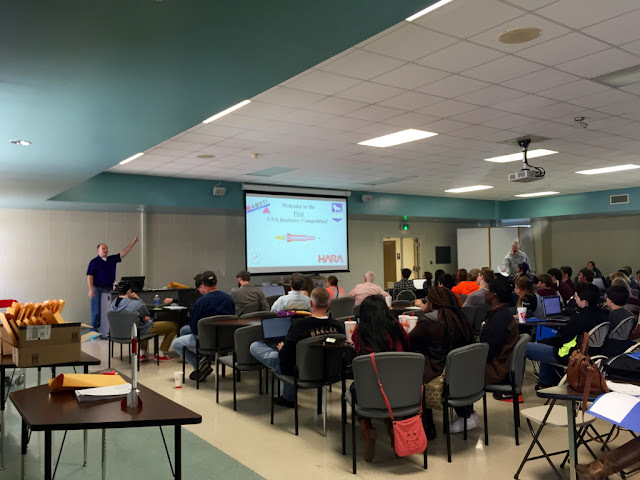 Lee Brownell starts the ball rolling at UNA's first TARC session (Click to enlarge). 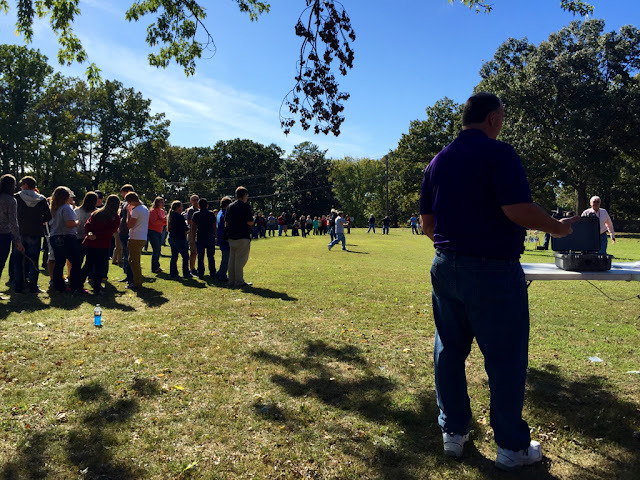 Highlight a competition that UNA is conducting using current TARC rules. 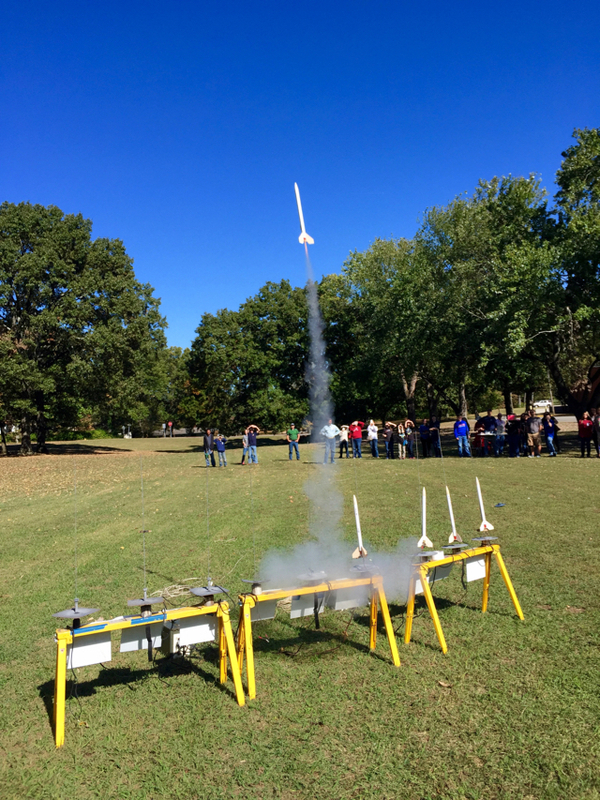 Basically, it's going to be a launch where kids fly their TARC rockets, with the best score(s) winning a prize. These launches can also be one or more of the teams' qualification attempts. At least half of the three hour meeting was spent going over basics. 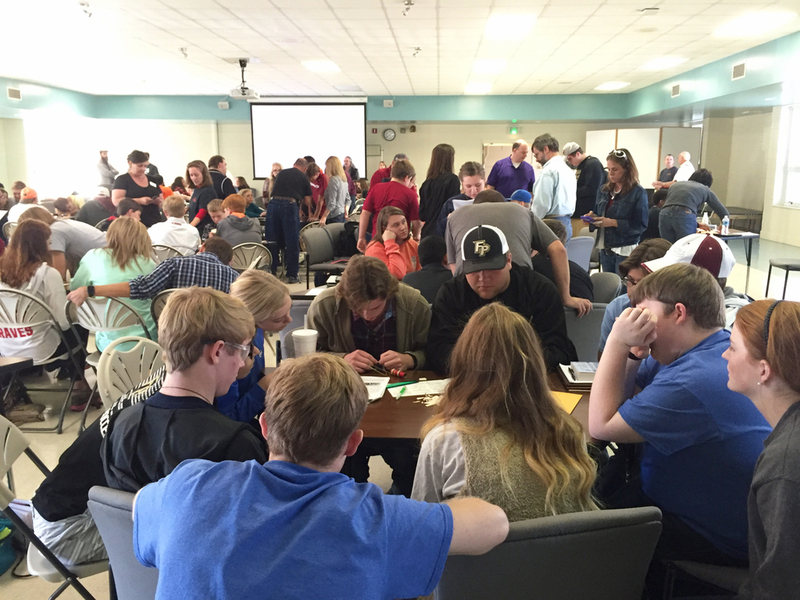 After that, each team built a rocket - the ASP NEO Standard - which was flown in the last 30 minutes of the session. Chuck, Duane, myself, Vince, and Woody had a primary job of setting up the range in the very small, tree lined field near the building where the meeting was held; some of us also helped the kids construct the rockets, which was done with superglue because of the lack of time. I must confess I was surprised that things went rather well, as I fully expected the usual messy stuck fingers and motor mounts locked only halfway in, but that happened in only a few instances. 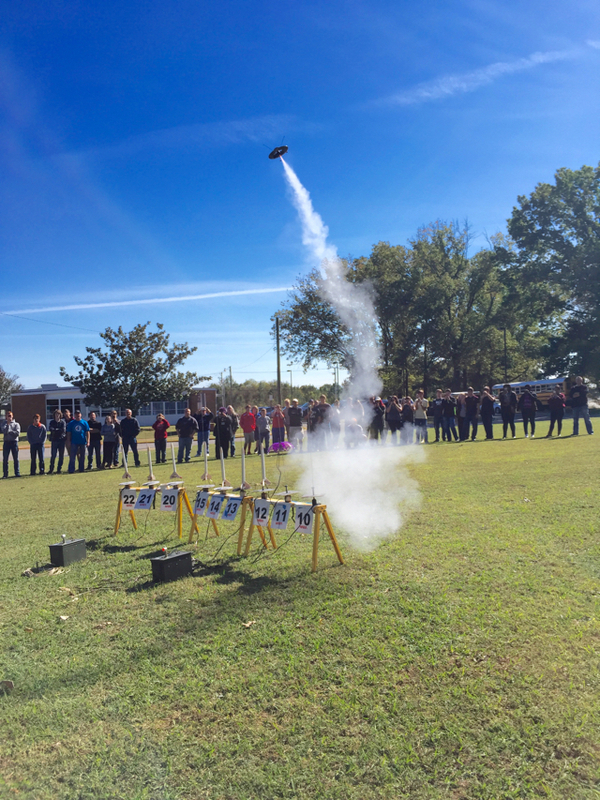 Most of the 20+ rockets were completed without much trouble. Once all the rockets were built, the kids brought them outside to the RCO station to receive motors and igniters; they were then sent over to the launch pads, where Woody showed them how to connect the clips to the igniters. The launch went rather smoothly - there were the usual igniter misfires, but no rockets disintegrated, though several did land on the roof of the building (they were later recovered). It is most fortunate that only A8-3 motors were used in the rockets - anything more powerful would have resulted in many tasty snacks for the rocket-eating trees. We packed up around 3:30 and headed back to Huntsville. We had eaten lunch at an Arby's about 1 mile from UNA on the way in; as we passed it on the return journey, we noticed that it was surrounded by fire trucks and some firemen were hosing down the building. Apparently the place had caught on fire while we were launching our rockets (Note: we were WAY too far from the Arby's for any rocket on A motors to reach it). I suppose we might have jinxed the place by eating there - maybe next time we should eat lunch at a place we don't like. 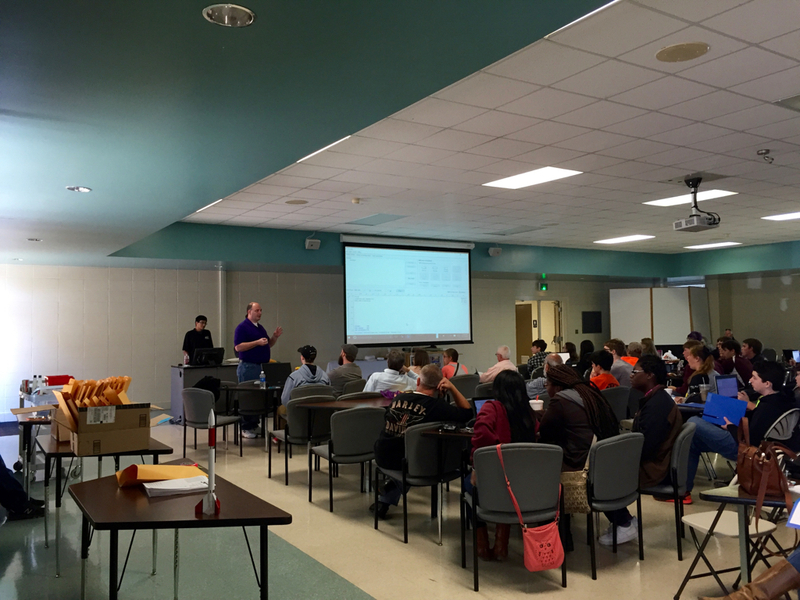 UNA is doing an excellent job in motivating the schools down the TARC path. They are planning to have a follow-up session in December, and are nicely supporting the local teams; expect great things out of northwest Alabama this season. As an adult volunteer for one of the teams present at this training I can say it was very well done. Thanks to the HARA pros for taking the time to be there and for the good advice and encouragement that you gave the kids.